Royal Enfield flagged off its first expedition to the Karakoram Pass, situated in the Karakoram range at 18,176 feet above sea level. The historic Pass served as the Afghan trade route and Royal Enfield says that no one has attempted to ride to Karakoram Pass on a motorcycle. 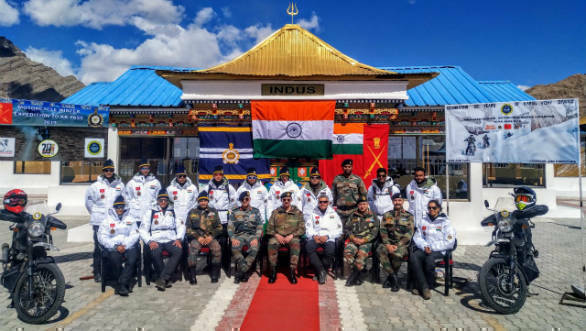 The expedition was flagged off by General Officer Commanding, 3 Infantry Division, Major General Sanjiv Rai, SM, VSM from the Karu Military Station. A total of 11 riders will attempt to cover the 1,000km journey over the next 14 days and aim to get their names in the record books upon reaching the summit. 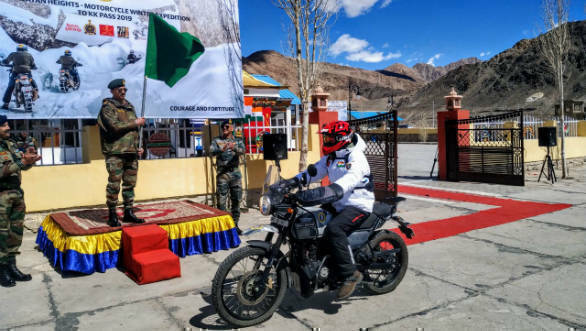 The expedition is led by the Indian Army comprising riders from the Army Service Corps, Royal Enfield and Himalayan Motorsports. The challenges that these brave riders will face are enormous as they deal with riding in cold weather, at high altitudes with the fear of AMS lurking. It sure is going to be a test of both the riders as well as the machines. The purpose of this ride is also to celebrate the 20th anniversary of the Kargil Vijay Diwas and revive the spirit of courage and adventure that's synonymous with the Indian Army. The riders will be astride the Royal Enfield Himalayan, a motorcycle that was designed specifically to tackle the odds in the Himalayas. Here's wishing the very best to the expedition.